The most coveted title in the sport of bodybuilding, the Mr Olympia competition saw its 53rd event this weekend in Las Vegas. It threw up some exciting and controversial results as well as the start of what is no doubt a new generation of aesthetic athlete stars. Though none more shocking than the crowning of a new king of bodybuilding. Looking to earn his eighth consecutive Olympia title and place himself amongst the hall of famers, Phil Heath has seen his first defeat at the Olympia in seven years. Only Lee Haney and the infamous Ronnie Coleman have managed to secure the record of eight individual titles. Reaching his pinnacle alongside the rise of social media and aided by his featured role in BodyBuilding documentary Generation Iron, Phil has become synonymous with modern day body building and ultimately an icon for the continued rise of the sport. This year’s champion, Shawn Rhoden has now competed eight times in the contest and has only previously placed among the top three once prior to this year’s victory. At 43 years of age Rhoden is the joint oldest competitor to ever win the title and in doing so collected the highest bodybuilding competition prize fund of to date of $400,000. A figure which in itself demonstrates the enormous growth of the sport and the industry. Rhoden an excellent role model for the sport in terms of the almost unbelievable conditioning he brings to the stage, but also in terms of positive mental attitude and staggering perseverance. Not only has he managed to deny an eighth consecutive win to a man who has seemed unstoppable at the age of 43, but Rhoden had actually pulled out of a major competition earlier in the year due to severe illness. He pulled out of the 2018 Arnold Classic after suffering near crippling illness from the result of not one but two stomach and bowel ulcers. To come back from this and present the physique which has now earned him the highest accolade in his sport shows incredible strength of character and determination. Somewhere in amongst all the science, supplements and trends, it can be easy to forget that so much about the sport of bodybuilding in all its forms, is fundamentally down to mental strength, will power and desire. No combination of elements will ever replace the need for genuine hard work and perseverance required to create a body to be proud of. 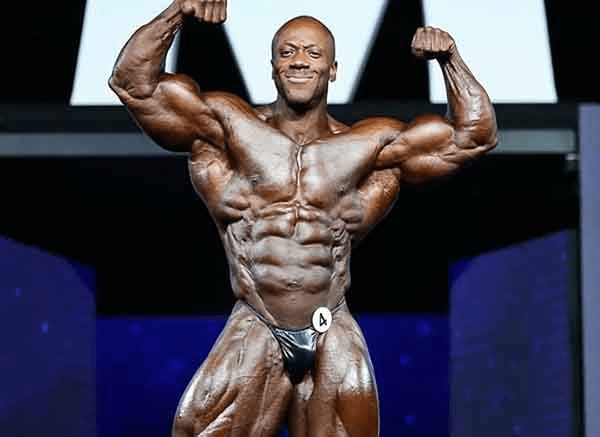 There is something else unique and potentially controversial about Shawn Rhoden’s win, which judging by the reaction of bodybuilding fans all across the internet is a welcome potential change in direction. Looking at the Mr Olympia line up this year, despite packing some serious muscle, Rhoden has gone on to win overall despite being far from the biggest guy on stage. In recent years and certainly for almost the last decade while Phil Heath has reigned supreme, it has become apparent that Olympia judges were increasingly favouring the ‘mass monsters’. Being drawn to the most beastly physiques on stage and rewarding the ability to carry the most muscle. There has been a building desire among the bodybuilding community and certainly among fans of the classic era including seven-time winner himself, Arnold Schwarzenegger, to see the biggest prize in the sport reflect a more aesthetically pleasing silhouette. Whether or not Rhoden’s recent win which has been put down to his extreme level of conditioning, dryness, deep cuts and overall superior symmetry is a reflection of a change in what it takes to win the crown only time will tell. What is for certain though is that other more arguably aesthetically pleasing categories of bodybuilding including the Physique category are building momentum and continue to attract a following of younger would be athletes. Backed by the rise of Instagram fitness trends and the gym wear fashion industry, physique categories are more popular than ever, and the top athletes are becoming household names among fitness loving millennials. Coincidently, the men’s physique category also saw a dethroning as four time champ and widely recognised competitor Jeremy Buendia didn’t even manage to place in the top three as he passed his title to newcomer Brandon Hendrickson. Stating in the process that this year would actually be his last competing at the Olympia given his struggles recovering from a nasty pec tear on the road to this year’s competition. In other results bikini athlete Angelica Teixeira retained her top spot as Bikini Olympia overall winner, making it two in a row for the young American. And as expected Cydney Gillon walks away with first place in the figure category.